As I sit down to write this post, the headline on the Fox News website is declaring that Nebraska Senator Ben Nelson has agreed to support the Senate Democrats' Health Care Reform bill. He was finally coaxed to sell out for his 30 pieces of silver, just like Mary Landrieu before him. She set the bar pretty high with a $300 million bribe for Louisiana. I wonder if Nebraska did as well. Our tax dollars at work! This brings the Dems to sixty votes, the number required to defeat a Republican filibuster, and send the bill to conference committee with the House. Not a done deal yet, but one more step on the way to a legislative trainwreck of historic proportions. So you can imagine, I'm feeling a little depressed right now. But I don't intend to wallow in despair for too long. I'd like to share a brief story with you. Last Wednesday night I attended a meeting of the 912 Delaware Patriots. Its one of those Tea Party organizations that have sprung up all over the country. We're mostly a bunch of gray or graying conservative citizens who love our country and are shocked by this juggernaut barreling down on us since the November election. I suspect the most common phrase you'd hear from this bunch would be, "I'm not usually very political but...". You get the idea. We feel like we have to take action to save this country from Barack Obama's vision of Entitlement America. At the end of last Wednesday's meeting, the founder of the group, Russ Murphy, got up and made some short closing remarks. 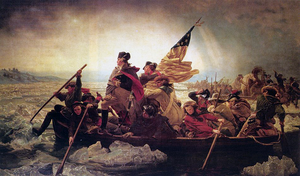 Washington won his victory, and though the numbers were small and the strategic value limited, this minor triumph has gone down in history as a turning point of the Revolutionary War. Today, we are engaged in another conflict, not with armies this time, but still, as then, with ideas. We don't deceive ourselves that our sacrifice compares in any way to theirs. But as they served their country then, let us not shrink from our duty to serve it now. Let us live up to the example that they set for us. Stay in the fight. Don't be discouraged. Let every battle we lose make us even more determined to succeed in those that are to come. They fought for their children and their grandchildren. Are our children and grandchildren any less important? November 2010 is less than a year away. I am dedicating myself to the goal of taking my country back. I want you to join me in this effort. A recent 912 Delaware Patriots newsletter included a slogan that I am adopting as my personal motto. "I am not just one person. I am one more."